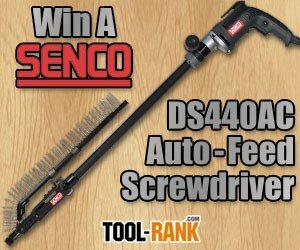 If your back is tired of you always having to bend over to screw down floor boards or decking, you are probably going to want to enter our giveaway to win a Senco DS440AC Auto-Feed extension screwdriver Kit. Senco was awesome enough to provide the DS440AC kit as the prize for this month's giveaway, and boy it is slick. Not only does the kit include a SG4100 auto-feed screwdriver that does away with having to load each screw by hand, but it also includes an extension pole that's makes it possible to screw to the floor without having to bend down. Depending on your needs, the SG4100 screwdriver can accept collated strip screws ranging from 1-inch to 3-inches. A depth-of-drive adjustment makes it possible to control how far each screw is driver into or below the surface. The giveaway is for (1) Senco DS440AC Auto-Feed Extension Screwdriver Kit. So how do you enter? See the widget below and follow the steps. You have a total of 8 different ways you can enter this giveaway. You can enter using only one method or you can use all 8 and have more chances to win. This giveaway is open to residents of the 48 Contiguous United States (including the District of Columbia) who are 18 years of age or older. Complete giveaway rules can be found here.